Friday night lights is the phrase but these games have more often been Friday night frights for Wales, the defeat by Samoa last year and the draw with Fiji in 2010 prime examples. Tonga couldn’t make it a hat-trick for the Pacific Islands, however, even if this was a pretty dour Test match for the 46,523 Cardiff crowd to witness. It was hardly a game to have those present in raptures – there were too many stoppages, little momentum could be created and not a single point was scored in the second half – but Warren Gatland will be satisfied with the win given recent history in this fixture and the fact that he’d made 11 changes to the side that beat Argentina last weekend. Tonga delivered in terms of physicality, had a solid set-piece and an organised defence, and caught Lloyd Williams on numerous occasions when he took too long to pass from the back of rucks. Wales were never able to get any rhythm to their game, but they did have far more try-scoring chances than Tonga, albeit that they only managed to convert two of them, Owen Williams and Ashley Beck going over. Lloyd Williams was held up, Hallom Amos was tackled into touch before getting the ball down, Luke Charteris dropped the ball metres from the line and George North had an effort ruled out by the TMO too. 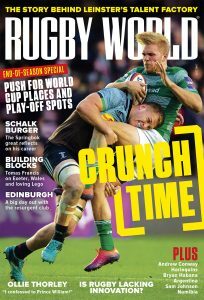 So not a classic, but a win’s a win, as they say, and Wales will face Australia next Saturday with more confidence than they did 12 months ago. They will also welcome the extra day’s rest for their battered bodies. Ashley Beck’s try in the 24th minute. The Ospreys centre had started the try-scoring move with a neat inside pop pass to George North, who powered through the Tongan defence, and once the ball was recycled James Hook delivered a long pass to Beck on the wing and he went over in the corner. The score was significant in that it gave Wales a 17-0 lead and Beck should receive praise for the way he managed to keep his foot centimetres from the touchline before grounding the ball. He was pushed close by another ‘old boy’ in James Hook, who ran the game well and with great variation from fly-half, but Ryan Jones gets the nod. It was obvious from the smile on his face during the anthem that he is relishing every opportunity he gets in the Wales jersey now those opportunities have become more limited with the emergence of Toby Faletau and Dan Lydiate in the back row. And, boy, was he looking to make a statement in this match. From the first minute he was making yards from the back of the scrum, he charged down a Tonga kick in their 22 that nearly led to a try for Lloyd Williams and his presence was evident throughout, be it through his carrying (he made 57 metres, nearly more than the other forwards combined), his defence or his leadership. It’s also fitting that he put in a performance of this quality three years after being axed as Wales captain following the Friday night draw with Fiji. 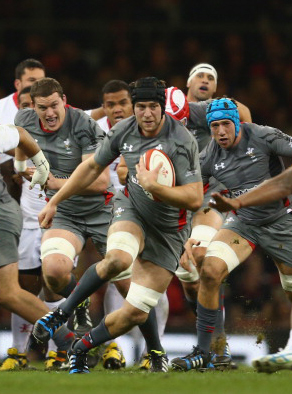 Wales made 156 passes to 53 from Tonga and made 483 metres with the ball compared to the visitors’ 308. The hosts also dominated territory (73%), particularly in the second half when Tonga barely got out of their half. 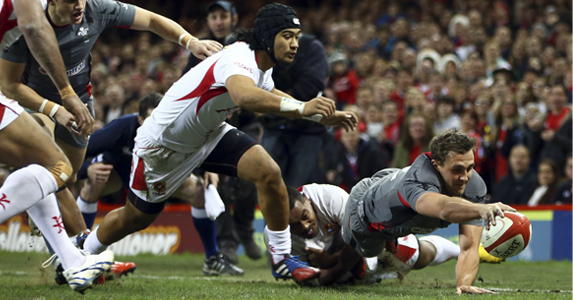 The turnover rate illustrates the stop-start nature of the game, Wales conceding 20 and Tonga 17.